Google Merchant Center is a potential Way of Earning and Getting Traffic by serious professional bloggers. There are less known interesting services by Google. 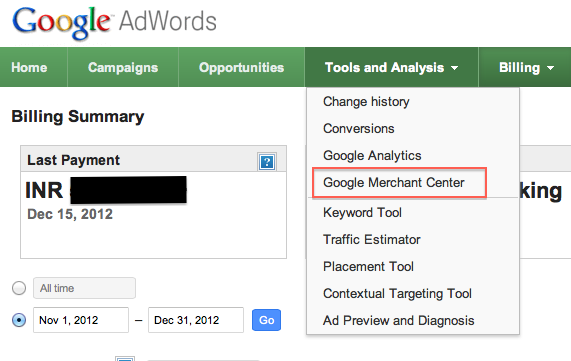 Google Merchant Center is bundled with Google AdWords. If you have AdSense account along with it, your address will be verified by Google on the next Payment cycle, if you are using Check as the payment option like in the way we said on Google Books for Authors and Publishers. This is a dedicated article on Google Merchant Center, as most avoids it without actually knowing about it. So there is no practical need to use conventional publishers – they will take nearly $3500 for making you a publisher (in case of health, we have no idea about the others). Practically it is useless thought to drive traffic. Basically we need to think about Return of Investment through multiple channels and digital media is more acceptable except the text books to new generation. You are now understanding the whole plan – you are writing a book (whatever does not matter much, that can be on why a dog’s tail remains curled to a complex theory, for your Complex theory, your University will handle the chopped down version), selling (if a book has no sell the author failed, its fact that you have to accept) through Google Publishers, Books etc. Plus this Google Merchant Center. 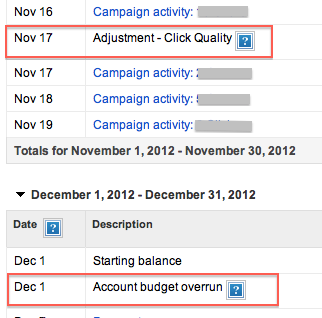 You can promote it through AdWords target to kill any book you want (in Google search). I have calculated, for $100 spend, it returns $300, if properly planned. If Google adds the schema.org thing instead of ISBN, in future, it will be more easy. Freedom, Money, backlink, direct traffic and becoming Author – packaged solution in transparent pack ! You can not sell products that are available for free and forms distributed by Government. Do not use a blog website url for your Google Merchant Center account. Use a dedicated domain (obviously apply the basics of SEO) as e commerce site. This Article Has Been Shared 1820 Times! 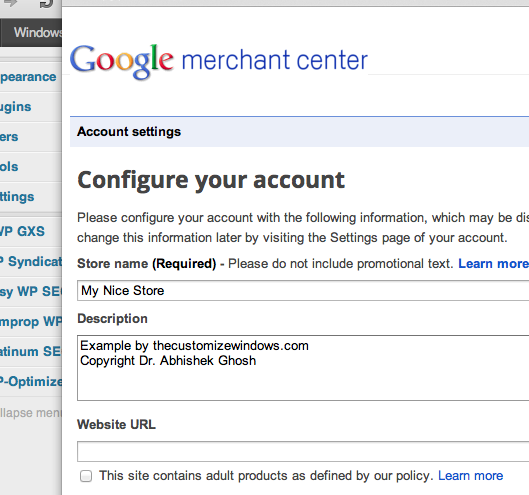 Cite this article as: Abhishek Ghosh, "Google Merchant Center : Potential Way of Earning and Getting Traffic," in The Customize Windows, December 18, 2012, April 21, 2019, https://thecustomizewindows.com/2012/12/google-merchant-center-potential-way-of-earning-and-getting-traffic/.